Beetroot halwa is a delicious sweet recipe made with just few ingredients - Beetroot ,milk and sugar. 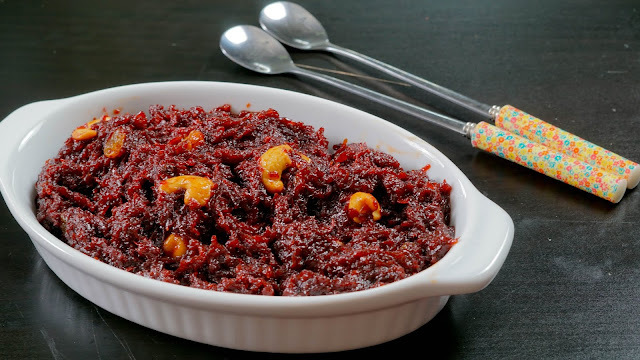 Not like other halwa recipes this Beetroot halwa can be made quickly in just few minutes, the process is simple and straight forward, it is easy to follow as well. This recipe is enjoyed by both kids and adults its healthy too..
We can follow the same procedure for making Carrot halwa. Step 1) Melt 2 tbsp of ghee in a pan and roast the cashews, once they turn golden add the raisins and saute it until the raisins are ballooned. Take it out of the pan and keep it aside. Now in the same pan add the grated beetroot and saute it for 4 -5 minutes until the raw smell is gone. Step 2) Then add milk get rich and creamy carrot halwa. We need to add more milk to get rid of the raw smell of the carrot. (anywhere from 1.5 cup to 2 cups of milk) ,Stir it in between to prevent from burning also scrape the edges to pull in any milk settlements. Cook on a medium heat. Once it thickens a bit add the sugar and mix well. the mixture loosens as soon as we add sugar. Keep it on a medium heat an cook until everything thickens. Step 3) Now add the roasted nuts, crushed cardamom or cardamom powder to get nice flavor, also add some ghee (1 tbsp) and mix well. Cook for few more minutes and turn off the heat.